Do you like those giveaways with multiple winners? Well, we have one of those for you here with three winners, and not all getting the same prize. Are you a fan of popcorn? If not, you might want to avoid the giveaway. Otherwise, enter your info in the giveaway form for your chance to enter. Runs through 8/30. Continental US only. packages, each containing a amazing Tower of popcorn and snacks. Our 7-tier Fun With Snacks design Tower contains tier after tier of deliciousness: Gourmet Rainbow Sandwich Cookies, Gourmet White Coated Rainbow Pretzels, Chocolate Chip Cookies, Sassy Taffy, Honey Roasted Peanuts, Jelly Belly® Beans and 3 flavors of gourmet popcorn: White Cheddar, Cheese and Almond Pecan corn. Perhaps the best way to put a smile on someones face is to provide a good example of what one looks like! And a Smiley Face Tower does just that. 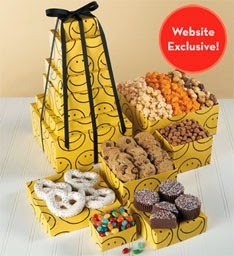 These simply adorable boxes stand six high and hold honey roast peanuts, assorted Jelly Belly® beans, creamy, chocolate fudge, chocolate chip cookies, 4 rainbow Bavarian pretzels and a box of our high-quality Cheese, Buffalo Ranch and Almond Pecan corn. 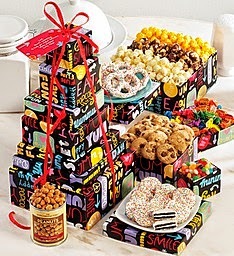 The gift boxes are stacked sky high and tied with a black ribbon. Our Summer Floral design Towers offer an impressive selection of gourmet delights. 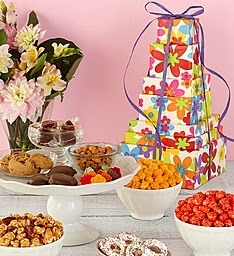 The 7-Tier Tower contains Awesome Blossoms Gummies, Honey Roasted Peanuts, Dark Chocolate Caramels, Chocolate Chip Cookies, Gourmet Rainbow Pretzels, Pixies® and 3 flavors of gourmet popcorn: Cheese, Almond Pecan and Cinnamon. Holiday Contest and Sweeps did not receive any form of compensation what so ever for this giveaway. The Popcorn Factory will be responsible for awarding and shipping the prizes directly to the winners.